Pendle sell a huge range of mens football shorts in 3 different sizes ranging from Small Mens to XL Adults. There are 3 very distinct styles to choose from and each style contains anything from 9 to 27 different colour combinations. All of our shorts are made from 100% polyester and due to the quality standards specified to all manufacturers, they will provide many years of use if cared for properly. The Vega short is the newest addition. It is made from a stretchable moisture wicking material and the design is simple with a contrast side stripe. The Astra is modern and plain offering arguably unbeatable value for money. Finally the Pulsar is the perfect match for many of our football kit ranges including New Napoli, Dortmund, Benfica, Lazio, Parma & Milano. The Pulsar has a contrast stripe with piping. All of our mens football shorts embody outstanding value for money and, as we always carry huge stocks, we can ensure that all ranges can be despatched the same working day if ordered before 2.00pm. This is a fantastic service for kits that need "topping" up urgently. 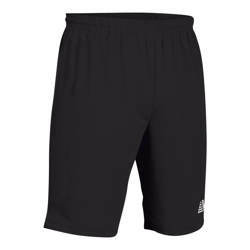 Choose from one of the many pairs of mens football shorts below and start saving money.